To evaluate the long-term visual and refractive outcomes, optical quality, and stability of the cornea and axial length after small incision lenticule extraction (SMILE) for the correction of high myopia with a maximum myopic meridian exceeding 10.00 diopters (D). Via a prospective cohort study, 53 eyes (53 patients) with a maximum myopic meridian exceeding 10.00 D were corrected with a VisuMax femtosecond laser (version 3.0; Carl Zeiss Meditec AG, Jena, Germany) at the Zhongshan Ophthalmic Center of Sun Yat-sen University. Refractive outcomes, aberrations, axial length, and corneal curvature were evaluated preoperatively and at 1, 3, and 15 months postoperatively. At 15 months postoperatively, the efficacy and safety indexes were 0.91 ± 0.25 and 1.15 ± 0.18, respectively. A total of 72% of eyes were within ±0.50 D and 89% were within ±1.00 D of the attempted spherical equivalent, respectively. From 1 to 15 months postoperatively, the significant regression was −0.24 ± 0.28 D (P < .001) on manifest refraction and −0.43 ± 0.54 D (P < .001) on anterior corneal curvature. In addition, a significant increase of 0.20 µm (P = .016) was observed in the spherical aberration. No significant change was observed in posterior corneal curvature (P > .999), including mean keratometry or astigmatism, or in the ocular axis length from 1 to 15 months postoperatively (26.82 ± 0.93 and 26.82 ± 0.95 mm, respectively, P > .99). 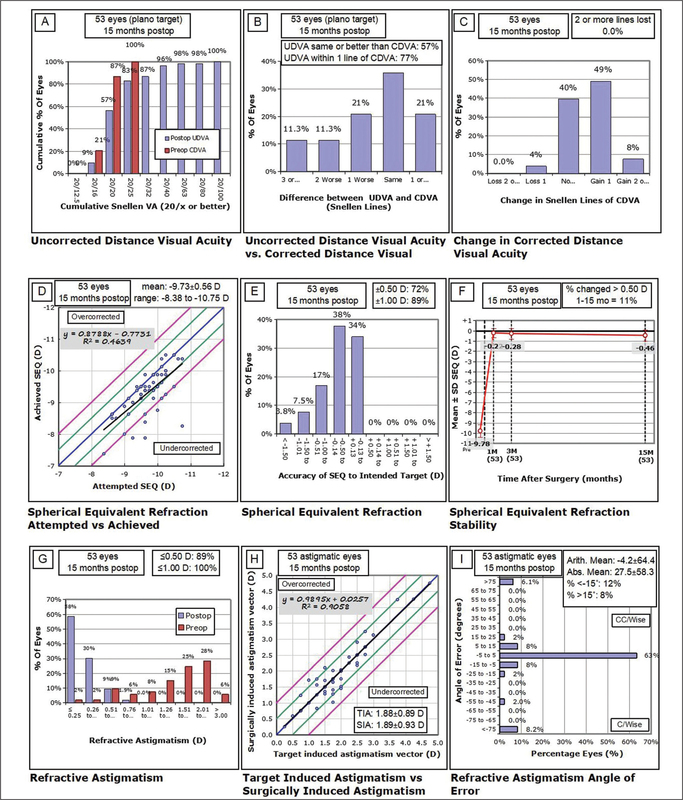 SMILE had long-term safety, efficacy, and predictability when treating high myopia with a maximum myopic meridian exceeding 10.00 D. Both a manifest refraction regression of −0.24 D and a significant spherical aberration increase of 0.20 µm were observed between 1 and 15 months postoperatively, due to the increased anterior corneal curvature. The newly developed “flapless” small incision lenticule extraction (SMILE), employing all-in-one technology, has been demonstrated to have long-term efficacy, predictability, safety, and stability when correcting myopia with a maximum myopic meridian of less than 10.00 diopters (D).1–5 After the 2016 SMILE software update, it was used to correct high myopia with a maximum myopic meridian exceeding 10.00 D and a spherical equivalent of 12.50 D or less, which was shown to be safe, effective, and predictable in the early stage by Qin et al.6 However, long-term follow-up is essential because a greatly reduced corneal thickness could lead to a significant loss of corneal strength, which may result in iatrogenic corneal ectasia or refractive regression. SMILE theoretically preserves the anterior stroma, and thus may have less biomechanical impact on the cornea.7–9 However, there have been recent reports on corneal ectasia after SMILE.10–14 Additionally, there is a dearth of research reporting the long-term clinical outcomes of SMILE in correcting the maximum myopic meridian exceeding 10.00 D. To address this gap in the literature, the current study evaluated the safety, efficacy, predictability, and stability of using SMILE to correct high myopia with a maximum myopic meridian exceeding 10.00 D up to 15 months postoperatively, in terms of visual and refractive outcomes, optical quality, anterior and posterior corneal power, and axial length. Fifty-three patients were enrolled in this single-center, prospective, cohort study. SMILE procedures were conducted at the refractive surgery center of Zhongshan Ophthalmic Center of Sun Yat-sen University (Guangzhou, China) from March to October 2016. The current study was performed in accordance with the tenets of the Declaration of Helsinki, and the protocol was approved by the Research Ethics Board of the Zhongshan Ophthalmic Center of Sun Yat-sen University, China. The study's inclusion criteria were patients with a minimum age of 18 years and who had stable myopia for at least 2 years, a maximum myopic meridian exceeding 10.00 D (cylinder from 0.00 to 5.00 D), no ocular conditions other than refractive error, and a residual stromal bed thickness exceeding 260 µm. The exclusion criteria were patients with a history of suspected or diagnosed keratoconus, previous corneal lesions, prior corneal surgery, cataracts, glaucoma, or posterior abnormalities. The baseline characteristics of the patients are summarized in Table 1. Axial alignment of cylinder refraction. (A) Using horizontal slit beam marking method to mark the axis of 0° to 180° on the peripheral cornea under sitting condition. (B) The manual compensation of cyclotorsion during small incision lenticule extraction. (C) The alignment of the horizontal marks on the eye to the 0° to 180° axis of the reticule. Examinations were performed preoperatively and at 1, 3, and 15 months postoperatively. Manifest refraction was measured and included uncorrected (UDVA) and corrected (CDVA) distance visual acuities. The UDVA was also recorded at 1 day and 1 week postoperatively. The safety index was calculated by dividing the 15-month postoperative CDVA by the preoperative CDVA (in decimal). 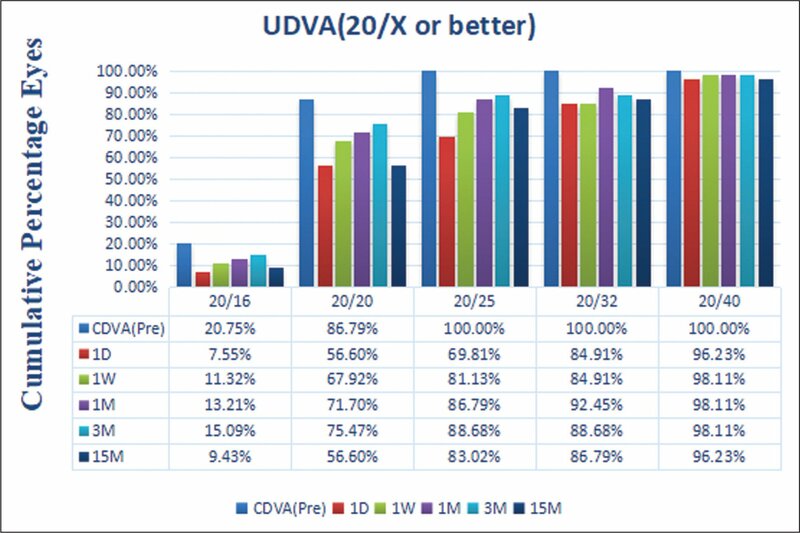 The efficacy index was calculated by dividing the 15-month postoperative UDVA by the preoperative UDVA (in decimal). The attempted spherical equivalent is the spherical equivalent planned to be corrected and the achieved spherical equivalent is the actual spherical equivalent corrected by SMILE. 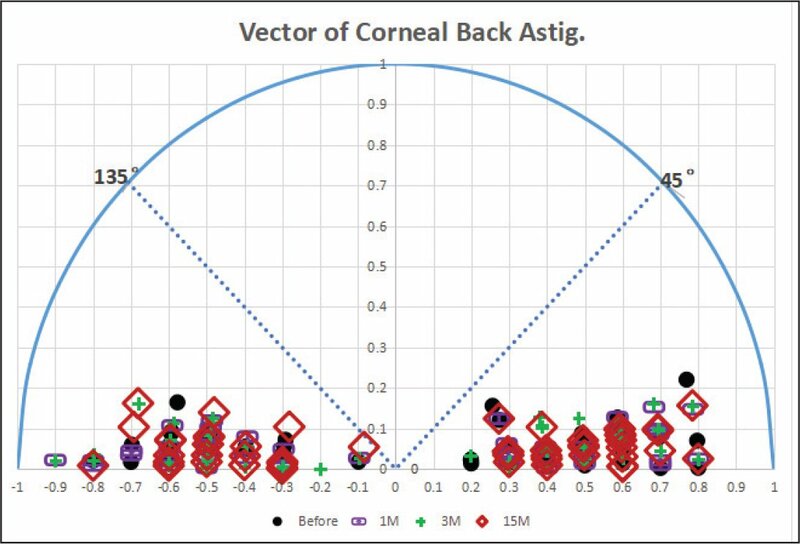 The target induced astigmatism vector magnitude and surgically induced astigmatism vector magnitude were evaluated.17 The values were adjusted for the corneal plane using a vertex of 12 mm. The Oculyzer (Oculus Optikgeräte GmbH, Wetzlar, Germany) was used to evaluate the anterior and posterior curvature. Only scans graded “OK” by the instrument were used in further analysis. It was analyzed with sagittal power, which represented the center 3-mm corneal area, including mean keratometry and corneal astigmatism power. The change in keratometry was defined by subtracting the postoperative keratometry data from the preoperative keratometry data. The central corneal thickness was also recorded. The IOLMaster 500 (Carl Zeiss Meditec) was used to measure the ocular axial length. WASCA (Carl Zeiss Meditec) was used to calculate the total high ocular aberrations (HOAs), coma, trefoil, and spherical aberration, under standardized scotopic light settings. The root mean square was used to analyze HOAs for 6-mm analysis diameters. All statistical analyses were performed using IBM SPSS Statistics software (SPSS version 21.0; SPSS Inc., Chicago, IL). For multiple comparisons of preoperative and postoperative quantitative results, repeated measures of a general linear model were applied. A simple linear correlation was used to analyze the relationship between the change in mean keratometry and the achieved or attempted spherical equivalent. The mean ± standard deviation was used as the normally distributed variable, whereas the median (range) was used as the non-normal distribution variable. A P value of less than .05 was considered statistically significant. A total of 53 eyes from 53 patients with a mean age of 25 years (range: 18 to 40 years) underwent SMILE. Of those patients, the preoperative spherical equivalent was −9.78 ± 0.60 D (range: −8.38 to −11.00 D) and the maximum myopic meridian was −10.75 D (range: −10.25 to −12.25 D). The baseline characteristics are summarized in Table 1. The intended lenticular thickness was 162.84 ± 9.78 µm. The change in the central corneal thickness was 140.00 ± 18.38 µm at 1 month, 136.13 ± 16.90 µm at 3 months, and 135.95 ± 17.47 µm at 15 months (P =.010 for 15 to 1 month, P > .999 for 15 to 3 months, and P = .030 for 3 to 1 month). The postoperative central corneal thickness was 421.24 ± 21.95 µm at 1 month, 425.11 ± 25.83 µm at 3 months, and 425.29 ± 26.17 µm at 15 months. Additionally, the predicted residual stromal bed thickness was 274.28 ± 18.99 µm. No significant difference was found in posterior corneal power from the preoperative values (Table 2), including flat keratometry, steep keratometry, mean keratometry, and astigmatism magnitude (P > .999 for all comparisons). The vector of posterior astigmatism was 0.06 ± 0.51 D for x axis and 0.06 ± 0.05 D for y axis preoperatively and 0.09 ± 0.52 D for x axis and 0.06 ± 0.04 D for y axis 15 months postoperatively (P = .693 for x axis, and P = .982 for y axis) (Figure 1). No eyes were diagnosed as having keratectasia during the follow-up period. Distribution of posterior corneal astigmatism vector preoperatively and at 1, 3, and 15 months postoperatively. The changes in Snellen lines of visual acuity are shown in Figure 2. The safety index was 1.15 ± 0.18. Additionally, the postoperative CDVA (logMAR) was −0.08 (range: −0.18 to 0.15) at 1 month, −0.08 (−0.18 to 0.05) at 3 months, and −0.08 (range: −0.30 to 0.00) at 15 months postoperatively, whereas the preoperative CDVA was 0.00 (range: −0.18 to 0.10). A significant increase was found postoperatively compared with the preoperative CDVA (P < .001 for all comparisons). The efficacy index was 0.91 ± 0.25. A significant decrease was found at 15 months postoperatively when compared with 1 month (P = .003), 3 months (P = .002), and the preoperative CDVA (P = .017). No significant differences were found between the 1-month postoperative UDVA, 3-month postoperative UDVA, and preoperative CDVA (P > .999 for all comparisons). The cumulative histogram of UDVA is shown in Figure B (available in the online version of this article). The scatterplot of attempted versus achieved spherical equivalent correction at 15 months postoperatively is shown in Figure 2D. The difference in attempted versus achieved spherical equivalent was −0.17 ± 0.45 D at 1 month (P = .047), −0.23 ± 0.50 D at 3 months (P = .008), and −0.41 ± 0.54 D at 15 months (P < .001) postoperatively. A significant undercorrection between attempted and achieved spherical equivalent was observed at 3 and 15 months postoperatively. The refractive astigmatism results are shown in Figures 2G–2I. The change in the manifest spherical equivalent is shown in Figure 2F. Following SMILE, the manifest spherical equivalent was −0.22 ± 0.46 D at 1 month, −0.28 ± 0.51 D at 3 months, and −0.46 ± 0.55 D at 15 months (P < .001 for 15 to 1 month, P = .001 for 15 to 3 months, and P = .101 for 3 to 1 month). The spherical equivalent regression from 1 to 15 months was −0.24 ± 0.28 D.
Meanwhile, the sphere refraction was −0.13 ± 0.42 D at 1 month, −0.21 ± 0.49 D at 3 months, and −0.33 ± 0.54 D at 15 months (P < .001 for 15 to 1 month, P = .042 for 15 to 3 months, and P = .025 for 3 to 1 month). The cylinder refraction was −0.17 ± 0.27 D at 1 month, −0.14 ± 0.24 D at 3 months, −0.26 ± 0.29 D at 15 months (P > .051 for 15 to 1 month, P = .004 for 15 to 3 months, and P > .999 for 3 to 1 month). After SMILE, the change in mean keratometry was 7.01 ± 0.77 D at 1 month, 6.81 ± 0.65 at 3 months, and 6.58 ± 0.65 at 15 months postoperatively (P < .001 for 15 to 1 month, P = .005 for 15 to 3 months, and P = .012 for 3 to 1 month). The decrease in the change in keratometry between 1 and 15 months postoperatively was −0.43 ± 0.54 D. Furthermore, the magnitude of corneal astigmatism power had no significant changes between 1 and 15 months postoperatively (P > .999 for 15 to 1 and 3 months and P = .532 for 3 to 1 month), with values of 0.84 ± 0.57 at 1 month, 0.76 ± 0.41 at 3 months, and 0.80 ± 0.53 at 15 months. The change in keratometry at 15 months postoperatively had a significant simple linear correlation with achieved (P < .001, R2 = 0.39) but not attempted (P = .057) spherical equivalent (Figure 3). Meanwhile, at 1 month postoperatively, the change in mean keratometry had a significant simple linear correlation with the achieved (P < .001, R2 = 0.50) and attempted (P < .001, R2 = 0.29) spherical equivalent. The value of change in mean keratometry versus achieved spherical equivalent at 15 months postoperatively was 0.71 ± 0.06. The value of change in mean keratometry versus attempted spherical equivalent at 15 months postoperatively was 0.68 ± 0.07, and it had a significant, simple linear correlation with the undercorrected spherical equivalent of the target refraction (P < .001, R2 = 0.40). The simple linear correlation analysis between the change in mean keratometry and attempted or achieved spherical equivalent (SE). The ocular axial length was 27.01 ± 0.92 mm preoperatively and 26.82 ± 0.93 mm at 1 month, 26.81 ± 0.94 mm at 3 months, and 26.82 ± 0.95 mm at 15 months postoperatively (P < .001 for preoperative to all time points, P = .241 for 1 to 3 months, and P > .999 for 1 to 15 months and 3 to 15 months). The comparison of ocular aberrations was shown in Table 3 and Figure 4. 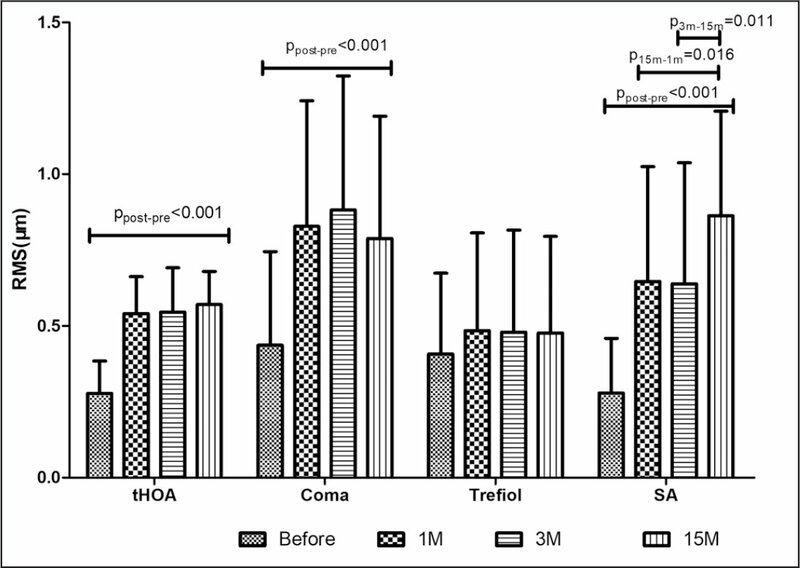 The induced aberration remained stable from 1 to 15 months postoperatively in total HOAs and coma but not in spherical aberration (P = .016 for 15 to 1 months and P = .011 for 15 to 3 months). To the best of our knowledge, this is the first article to describe the long-term clinical results of SMILE to correct high myopia, of which the maximum myopic meridian was −10.75 D (range: −10.25 to −12.25 D) and the preoperative spherical equivalent was −9.78 ± 0.60 D (range: −11.00 to −8.38 D). The corneal safety was emphasized after deep corneal ablation with SMILE. Moreover, the causes of manifest refraction regression were analyzed. In our study, the intended lenticular thickness was 162.84 ± 9.78 µm, which was the thickest compared to the previous research on SMILE.3,6,18 In fact, the actual change of corneal thickness was 20 µm less than the intended lenticular thickness, but it was assumed that the epithelial thickening response after SMILE contributed to this result.19,20 According to Ivarsen et al. 's equation,19 the increased corneal epithelial thickness was approximately 15 µm in our study. However, it could not be ignored that there have been five reports on eight eyes observed with corneal ectasia after SMILE.10–14 Seven cases were detected within 12 months after SMILE and only one was detected 4 years after SMILE. The main cause of the SMILE-induced ectasia cases was preoperative forme fruste keratoconus or early keratoconus tomography, which has already been seen as a contraindication in our study. Meanwhile, two unilateral SMILE-induced ectasia cases had normal preoperative tomography, with the intended lenticular thickness of 82 and 94 µm, respectively. It was reported that a thick flap creation and low residual stromal bed thickness could add to the postoperative ectasia risk.21 But in these two cases, the cap was 110 and 120 µm and the residual stromal bed was 305 and 308 µm.11,22 In our study, the cap thickness was set from 110 to 130 µm with a mean of 117.55 ± 5.22 µm, and the residual stromal bed thickness was 274.28 ± 18.99 µm (range: 260 to 330 µm). Thus, another perspective implied that the preoperative corneal biomechanical responses should be studied further.23 Moreover, the change in central corneal thickness decreased from 1 to 3 months postoperatively and then remained stable. In other words, no significant decrease was found in the postoperative central corneal thickness from 1 to 15 months postoperatively, meaning neither the mean keratometry nor the posterior astigmatism vector were affected. Consequently, in patients with normal topography and adequate preoperative central corneal thickness, SMILE was safe. Regarding safety, our study revealed that SMILE had long-term efficacy and predictability in treating high myopia with the maximum myopic meridian exceeding 10.00 D. At 15 months postoperatively, the efficacy index was 0.91 ± 0.25, 83.02% of eyes had a UDVA of 20/25 or greater, and 89% of the treated eyes were within ±1.00 D. Realistically, these results were not superior to laser in situ keratomileusis (LASIK) or implantable collamer lens implantation.19,20,24–29 It was the first long-term study to use SMILE to correct extreme high myopia, whereas LASIK and implantable collamer lens implantation have already been used for more than 10 years with continuous improvement in their nomogram. In fact, choosing appropriate surgical treatment for extreme high myopia is still a challenge for refractive surgeons. Flap-related complications and excessive residual stromal bed ablation after LASIK, anterior subcapsular opacities, rotation requiring realignment surgery, high postoperative intraocular pressure, and mean endothelial cell loss after implantable collamer lens implantation still could challenge the surgeons.29–32 Based on our long-term results, SMILE could be considered when treating high myopia errors with the maximum myopic meridian of greater than 10.00 D and a spherical equivalent of less than 12.50 D. However, some limitations could not be ignored even with SMILE. For example, enhancements are much more difficult to perform, either losing the advantages of having a cap instead a flap if using the “circle” approach or having the unpredictable results of a surface ablation over a cap. Consequently, the precise nomogram for SMILE to correct high myopia was essential. The current study showed a significant spherical equivalent regression of approximately −0.24 D from 1 to 15 months postoperatively. Previous research assumed, without clinical evidence, the increased ocular axial length and the steepening of the cornea were the main reasons for the manifest refraction regression after SMILE.4,33–35 However, in our study, the postoperative axial length remained stable after 1 month postoperatively. Nevertheless, it was found that anterior change in mean keratometry decreased significantly between 1 and 3 months and 1 and 15 months postoperatively. Consequently, the increased anterior central corneal curve was the main reason leading to the regression of manifest refraction. Pedersen et al.2 reported that a significant regression in the total corneal mean keratometry was seen, with an average of −0.36 ± 0.29 D from 3 months to 3 years postoperatively and without significant regression of the subjective refractive spherical equivalent. In our study, we determined that correcting 1.00 D of myopic refraction requires an anterior change in mean keratometry of 0.71 D. However, the change in mean keratometry versus attempted spherical equivalent was approximately 0.72 D at 1 month, 0.70 D at 3 months, and 0.68 D at 15 months postoperatively. It could be implied that when the anterior change in mean keratometry versus attempted spherical equivalent decreased to less than 0.70 D, the significant spherical equivalent regression would be observed. Under the nomogram used in this study, 21% of eyes had a 15-month postoperative spherical equivalent of less than −0.75 D, 28.3% of eyes were emmetropic, and no eyes were hypermetropic. If the −0.75 D sphere refraction was applied as previous articles recommended, some of the eyes would be hypermetropic, which was not appropriate to correct extremely high myopia.6 In fact, there are safe enhancement methods for undercorrection after SMILE.36–38 Consequently, maintaining the stability of the anterior corneal surface postoperatively is more urgent than increasing magnitude to the corrected spherical equivalent. Visual quality was consistent with Qin et al.6's results: increased total HOAs, coma, and spherical aberration were observed in our study, even 15 months after SMILE. SMILE-induced HOAs are related to the corrected spherical equivalent and optical zone.39 One of the problems with correcting high myopia was the high level of aberrations induced. Also, it has been declared that the increased coma after SMILE was due to decentration. However, in our study, the surgeon was experienced. Thus, it was implied that the increased coma was due to the deflection of the anterior cap collapsing toward the residual stroma.40 In addition, one of the major findings of this study is that the degree of spherical aberration induced increased between 3 and 15 months postoperatively. The anterior corneal surface shifted from a prolate to an oblate shape after SMILE. However, from 1 to 15 or 3 to 15 months postoperatively, the anterior corneal power at the center 3 mm increased and it affected the postoperative corneal asphericity. Moreover, there were significant correlations between the changes in spherical aberration and corneal asphericity.41 Consequently, the increased spherical aberration was observed from 1 or 3 to 15 months postoperatively. In fact, it did not affect the postoperative CDVA, and the safety index was 1.15 ± 0.18. Furthermore, the postoperative significant increase was comparable to the preoperative CDVA. However, the increased ocular HOA and/or spherical aberration at the 6-mm pupil influenced night visual outcomes, including glare, halo, and reduced contrast sensitivity.42 Consequently, contrast sensitivity should be evaluated in future studies. It has been claimed that one of the advantages of SMILE versus excimer laser treatment is the lower degree of spherical aberration induction in the early stage. Future studies are needed to evaluate whether there was an advantage in induced spherical aberration between SMILE and excimer laser in the long term when correcting myopia exceeding 10.00 D.
This study has limitations. The reasons for the anterior corneal regression were not evaluated in this study. First, the long-term wound healing and/or epithelium remodeling process may be attributed to it. Second, it may be due to the mismatch of the anterior surface of the cornea between the two surfaces of the curvature of the residual stromal bed, because it is flatter than the posterior surface of the corneal cap. Consequently, the cap shape, corneal wound healing, and epithelium remodeling processes after SMILE need further study in the long term. SMILE has predictability, safety, and efficacy when treating high myopia with maximum myopic meridian exceeding 10.00 D. Otherwise, both a regression of manifest refraction with −0.24 D and a decreased objective visual quality were found from 1 to 15 months, due to the increased anterior corneal curvature. Dawson DG, Grossniklaus HE, McCarey BE, Edelhauser HF. Biomechanical and wound healing characteristics of corneas after excimer laser keratorefractive surgery: is there a difference between advanced surface ablation and sub-Bowman's keratomileusis?J Refract Surg. 2008;24:S90–S96. Health Quality Ontario. Phakic intraocular lenses for the treatment of refractive errors: an evidence-based analysis. Ont Health Technol Assess Ser. 2009;9:1–120. Sayman Muslubas IB, Kandemir B, Aydin Oral AY, Kugu S, Dastan M. Long-term vision-threatening complications of phakic intraocular lens implantation for high myopia. Int J Ophthalmol. 2014;7:376–380. From Zhongshan Ophthalmic Center, State Key Laboratory of Ophthalmology, Sun Yat-sen University, Guangzhou, China. Supported by The National Natural Science Foundation of China (Grant No. 31671000).